Amour d’auberge is ideally located at 2 minutes from the famous square of Jeema el Fna. Amour d’auberge is a very friendly hostel, it will refresh your mind in a place where coffee is so spicy, sweet that your taste buds will vibrate with excitement (and caffeine! ), and the possibilities will feel endless. Guests will enjoy a rooftop terrace and an onsite restaurant. Amour d’auberge is the perfect place to stay for adventurers, travellers who are looking for a different experience and meet new people. 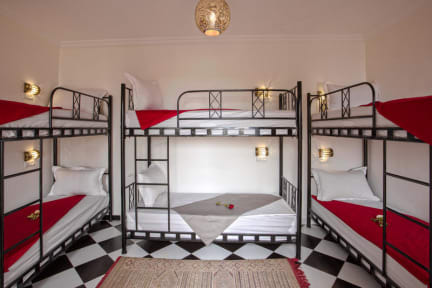 Amour d’auberge is located 2mn from the main square Jeema el Fna, souks and Palace Bahia. The hostel is located in the heart of the city. Perfect location for those who wants to discover the richness of the Red City. Amour d’auberge offers a wide range of shared accommodations up to 8 people. The hostel has male, female and mixed dorms. All dorms have bunk beds, air conditioning, wardrobes, shower and toilet collective. Check-out time is 1 pm.